Table Size: 96″ x 48″ (LxW) In Inches ( folding unit) ; Chair Size: 20″ inches Height Approx. 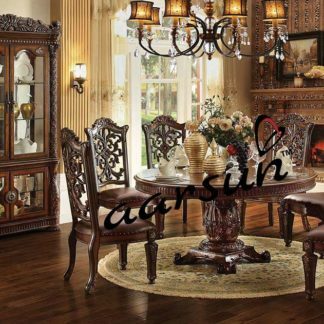 Aarsun Woods brings to you a traditionally handmade wooden dining set / dining table with oak finish. Dining table is the most stunning piece among all the dining area accessories as it is the primary furniture unit for any dining room. Comfortable, affordable and simple to care for, the traditionally designed wooden Dining Table sets is a great match for many different lifestyles. The rich, teak wood and smooth finish contrast well with a range of colour schemes, and with a handcrafted finish it’ll certainly last for long. The dark colored oak finish on this simple and stylish dining table will embellish the dining area. The elementary design of the dining table is such that it ensures the elegant ambience in the room.The Teak wood provides strength to the dining table and keeps the load on the legs of the table due to the mechanics of the structure used for the dining table. The 8 chairs also compliment the basic design of the dining table enhancing the overall appeal of the 8 seater wooden dining set. 8 seater dining set has captivating looks and can easily blend with any home interior. The product can be used for multipurpose like dinner, party or a small get-together. Sophisticated looks of the product will get you lot of compliments.